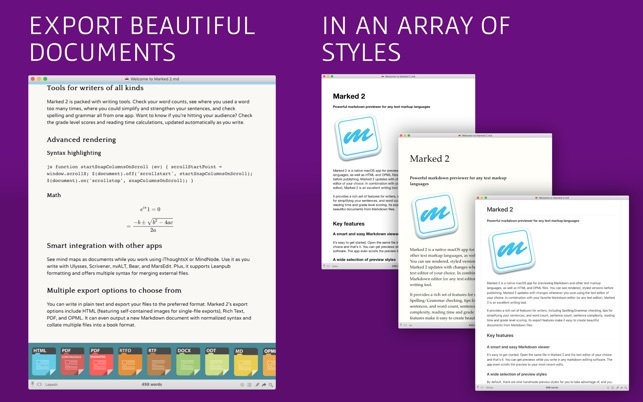 Marked 2 is a previewer (*not an editor*) for Markdown, MultiMarkdown and other text markup languages. 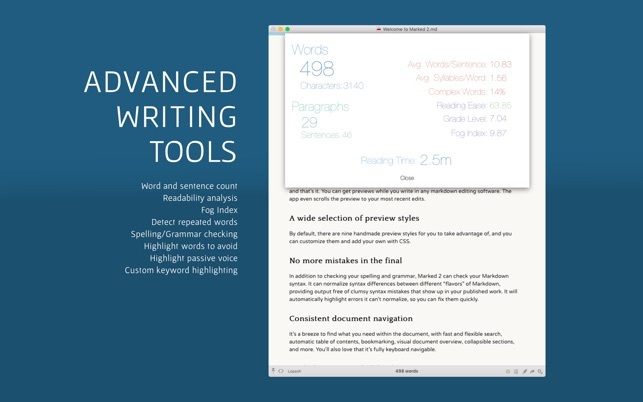 It updates live every time you save your document in your favorite text editor, comes with writing analysis tools, and is powerfully flexible. 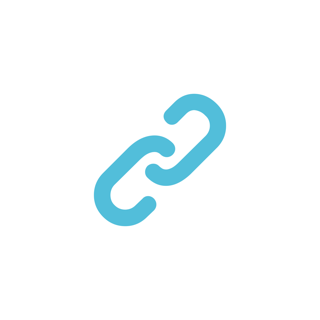 Marked provides document navigation and statistics, proofreading tools, multiple export formats, and much more. Marked comes with 9 preview styles built in (including GitHub), and you can add unlimited custom styles of your own. 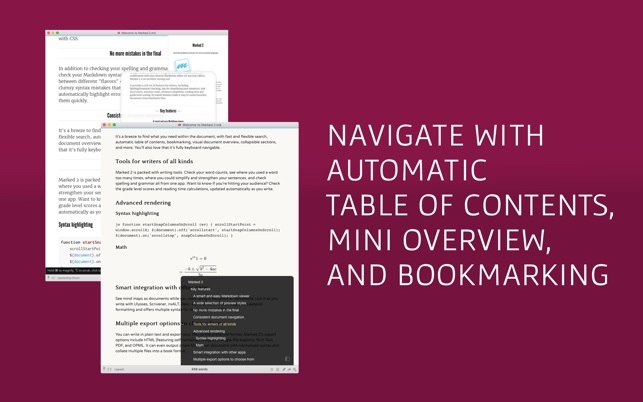 MultiMarkdown processing is provided for writers, complete with tables, footnotes, file transcludes, and other MultiMarkdown-specific features. GitHub users will appreciate Marked's built in GitHub Flavored Markdown processor, capable of handling fenced code blocks, line break preservation and automatic hyperlinking. Marked is powerful enough to allow custom processors (shell scripts) before and/or instead of the built in processors, allowing custom Markdown processing and use of non-Markdown text processors. 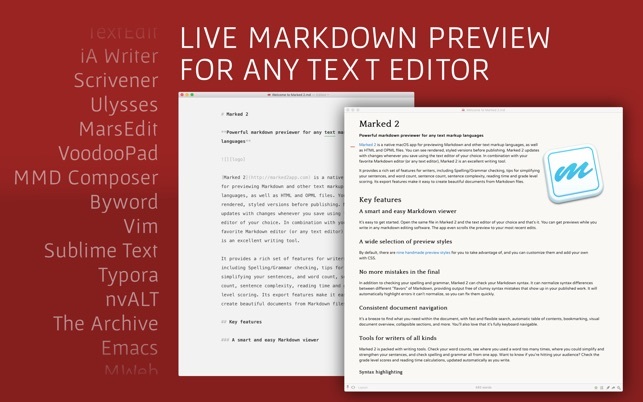 Marked works with Scrivener, Ulysses, MarsEdit, Highland 2, iThoughtsX, MindNode, and other third-party apps, allowing you to use Markdown and see beautiful previews just about anywhere. Lots of fixes, improvements, and special treats for Bear users! - Due to bugs in the version of Webkit in Marked, fixed elements on the screen are being pared back. The TOC flickers enough on its own right now. So the document progress indicator option has been removed. I love writing in Emacs using markdown mode. Just write write write, without putting any significant thought in to formatting the doc, since markdown is so simple to do. When it comes time to render the doc and fine-tune the look, Marked 2 is really helpful for this. Its fast. It puts “here’s where the last edit was” markers in the side bar. It provides a pop-up table of contents to make navigating easy. Plus it has dozens of features I haven’t even begun to use yet. Originally, I purchased this app only because I follow Brett Terpstra’s blog and wanted to give him a little support for all the great information I get from his blog. I guess I shouldn’t be surpried that I actually ended up using the app! Its one of those “it just works” kind of things. 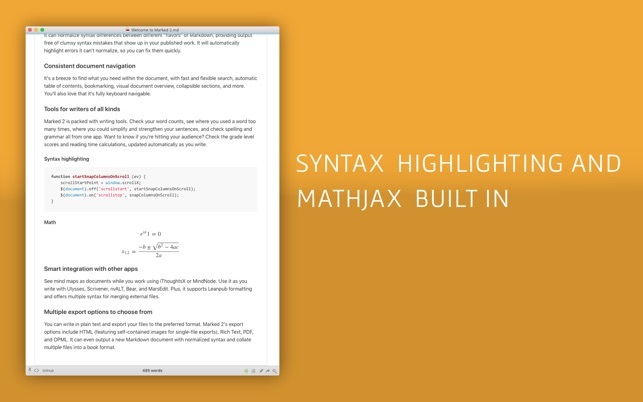 If you write in Markdown, you should get Marked 2. If I’m writing on my Mac, there’s a good chance that Sublime Text and Marked are side by side. It’s lightweight and does exactly what it says on the tin, looking nice all the while, and it’s a much nicer workflow than saving out to html then reloading a webpage. Instead, just hit ⌘+s and Marked refreshes. This is the kind of app that makes me love the Mac. I have been using this app for over a year. I spent a lot of time looking at competeing products before choosing this one.